What follows is a guest entry written by the amazing Leslie! I took the Megabus from DC to Philly, although I ended up on a later bus than Jason because people in DC know how to take advantage of a three-day weekend - hence the 10:15 bus was full. After a three-hour bus ride (which arrived early) I found myself sitting in the Philly Amtrak station waiting for Alisa, JT and his friend Vy to arrive. I read people's blogs on my smartphone and "checked in" (receiving the "Pennsylvania" badge). JT and Vy arrived (searching for me in the station like Waldo), and soon after Alisa arrived in her car to pick us up. Upon arrival, JT presented Alisa with the coveted treasure box of Porto's pastries [which you HAVE to try if you are ever around LA], and Alisa just about died from the excitement right there in the taxi/pick-up area. 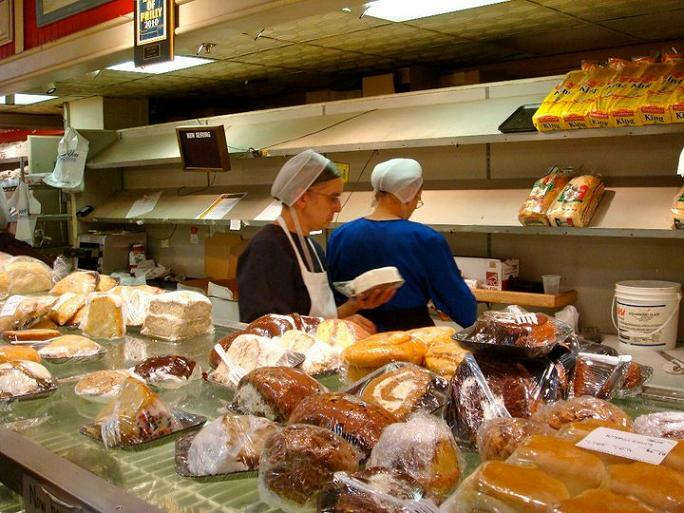 We ended up going to Reading Terminal Market, a large central market, sort of like the public market in Emeryville [or the SF Ferry Building, or LA's Farmers Market], except Amish and much more intense. Vy split off to buy a set of produce (including bok choy) for only $6. Jason and Alisa got delicious smoothies, and I waited in line for pumpkin ice cream - my favorite. I love when the seasons are starting to change, and one of the first indications is when pumpkin ice cream appears. 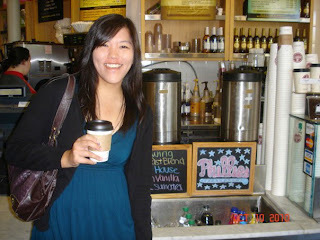 We then left the market and walked over to a cupcakery that Vy suggested - Philly Cupcake. 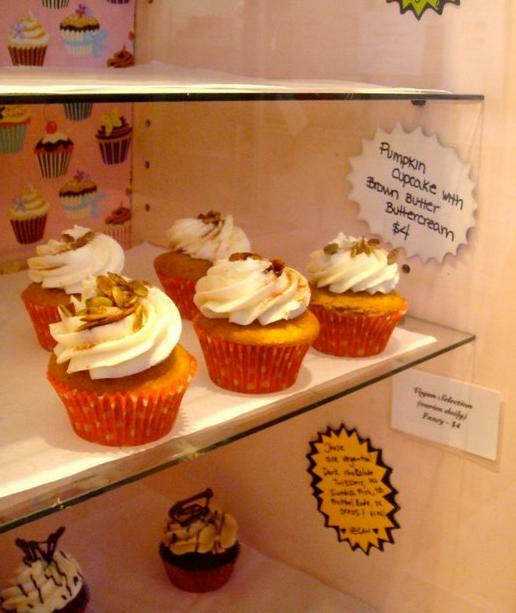 The cupcakes are stored in adorable cabinets which the employees open for you. I ordered a strawberry lemonade cupcake (but have yet to eat it); Jason got the pumpkin. We then drove Vy back to her place (which was nearby), and headed to Alisa's place in the suburbs. Along the way, we passed by "boat houses" along the river (and visible from the freeway), saw pitch black squirrels and laughed, and ranked fast food chains by burger quality. We arrived at Alisa and Laura's apartment. Laura seems very neat. Alisa's boyfriend Christian soon arrived with the aero bed and pump! The plan for the evening was to head into Philly's Old City, where we'd meet up with Laura. We were going to take the train, but it was scheduled to leave in 10 minutes and the station was an 8 minute walk. Frantically and indecisively, we all began to chaotically get ready in under 2 minutes. But instead we just decided to drive! Along the way back into the city, we named her car Raichu. We arrived, found a parking space relatively easily, and wandered around, checking out the bars and restaurants. Some locals in line at an iconic ice cream shop gave us advice on where to go - a nearby restaurant called Triumph. It was promising but the service was lacking [to say the least!]. My caesar salad was below mediocre. Laura met us, and she brought two friends who had just been married. Tired of Triumph [with its unique unisex bathroom], we returned to the ice cream parlor and Laura and Alisa each got some ice cream, which was served in Chinese take out boxes. Enough for the evening; we drove back to the apartment, where Laura gave us a tour and showed us her incredibly overwhelming headband collection. I want all of them! We woke up early in the morning; Jason and I walked around the shopping center next door, but the stores weren't open yet this Sunday morning. There was a farmers' market, with a cafe called Saxby's, where I got a chai latte. And at Trader Joe's, Jason got these really good flax seed chips. We played 20 questions as we walked around the empty shopping area and back to the apartment. And that's where we are now. Soon we'll be off into the city again - to have dim sum and Rocky our way up the steps of the Art Museum, and possibly experience happy hour at Morimoto. We need to get out of here!